Looking to bring a little Hygge into your life? Want to experience some of that Scandi-Noir atmosphere for yourself? Why not treat yourself to a city break in Scandinavia? Located on Sweden's wild west coast, effervescent Gothenburg is a trendy port city that's quickly becoming one of Europe's hottest spots. The city's compact centre is laced with cobbled streets and wide promenades that become thick with locals enjoying Gothenburg-brewed beer and freshly-caught seafood as soon as the sun breaks. Outside the city, explore the wilderness of Gothenburg's southern archipelago, a clutch of car-free islands a short ferry ride from the city that's perfect for beach hopping, bike rides and seal spotting. Straddling the Limfjord, the channel of water that slices across the Jutland peninsular, Aalborg has largely been overlooked by tourists looking for that slice of Scandinavian life. Laidback Aalborg has plenty to keep you busy, from its stunning architecture to the vibrant Aalborg Carnival, which takes place every May. About 100km north of Aalborg lies the unassuming hub of Skagen, Denmark's northernmost town that has attracted artistic types for decades, drawn by its wild landscape and the curious sight of two seas (Kattegat and Skagerrak) meeting off the coast. Feel like you're on top of the world with a visit to Tromsø, the so-called 'Gateway to the Arctic', located 400km north of the Arctic Circle. Once a base for Arctic expeditions and seal hunting, modern Tromsø is popular with those looking to catch a glimpse of the spectacular Northern Lights. Indeed Tromsø is one of the best places in Europe to witness the Aurora Borealis, although the city's bustling cultural scene, heady nightlife and iconic Arctic Cathedral mean Tromsø is a must-see whether you're going for the Northern Lights or the Midnight Sun. Norway's maritime past comes to life in the picture-perfect Bergen, an old fishing port nestled in the country's dramatic fjords. 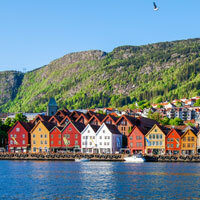 Tourists flock to the UNESCO World Heritage-protected neighbourhood of Bryggen, home to multi-coloured, Instagram-ready clapperboard houses lining the waterfront. But while Bergen is undoubtedly pretty, the real magic happens in the fjords further along the coastline, where towering mountains plunge down into still, icy waters. Expect rain when you visit – the city gets around 240 days of precipitation a year – so you might want to invest in a new raincoat before you go. A short bus ride north of ever-vibrant Malmo lies the small university city of Lund, home to one of Sweden's most spectacular medieval old towns. Tight streets twist and turn around college buildings, ancient churches and the city's striking cathedral – while the impressive Botanical Gardens is the perfect place to laze away a summer's afternoon. It's the university (one of Europe's most prestigious) that makes Lund what it is today, and the streets have that unmistakable student buzz as revellers spill out of cosy bars and cafes and onto the city's picturesque cobblestone streets. Tempted to make Scandinavia your next port of call? Make sure you're covered for every eventuality on your trip with World First's dedicated city break travel insurance. Get your quote today.